The Lyons Share: What has pan-species listing Sussex Wildlife Trust's reserve network done for us? What has pan-species listing Sussex Wildlife Trust's reserve network done for us? As there is an excellent article in BBC's Wildlife Magazine on pan-species listing this month, I thought I would celebrate the updating of the master pan species-list for Sussex Wildlife Trust reserves. Since I first compiled the spreadsheet around two years ago, we have increased the number of species recorded on the 32 reserves from 9790 to an incredible 10241 species, that's a 4.6% increase. This is an incredible achievement, especially when you look at the total number of new site records across all the 32 reserves. There have been in just two years, 4727 species recorded new to a particular site. We certainly would have recorded many of these without the spreadsheet but a large number of them are being driven by having this resource. 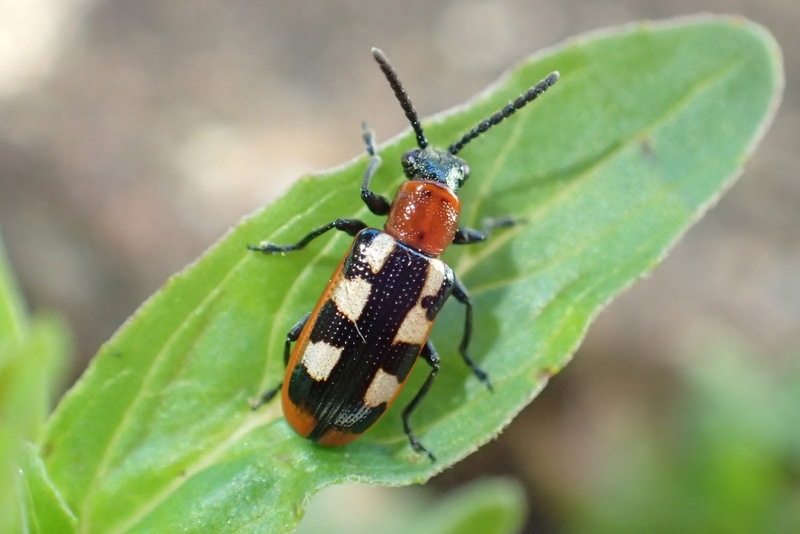 Above is the Six-spotted Pot Beetle Cryptocephalus sexpunctatus (nationally rare, Endangered, BAP) that Alice found at Flatropers in 2017 (Alice's photo too). We have not found another. It's one of the most significant discoveries we have made on our reserves in recent years, I am unbelievably gripped and despite two attempts we have not found another. Alice found this while doing some casual recording (we carried out a more comprehensive survey there in 2014). Analysing a site list like this using the pan-species listing approach gives as much weight to casual recording as it does to standardised surveys. It pulls it all together in a way that a more rigid monitoring strategy alone might not. Now I am not in anyway suggesting that structured monitoring is anything other than a wonderful and vital thing but this is another layer to site assessment that is often missed because it requires a bit of work to pull it together and a good knowledge of taxonomy and conservation status. I'd like species recording to stay at the very core of modern conservation. Quite often you might not record the rarest species on a site during a survey because they are there at extremely low densities, might be present at different times of the year to when you are surveying and of course might not have even been there at all at the time. Only this week when working through some casual recording I did with the suction sampler at Seaford Head last May, I recorded Dipoena prona (nationally rare & Endangered), this is the first record in Sussex since 1900 and the first for the network, it's REALLY rare. I found Pardosa paludicola (nationally rare, Endangered) during a standardised survey (at Butcherlands in 2017). Thanks to Evan Jones for the photo. However it was recorded, it exists on the spreadsheet as a single row. This is the beauty the pan-species listing approach. All species count with an accumulative list. There have been some huge jumps in the individual site's species-lists. Ebernoe Common has jumped by 8.8% from 3711 species to 4037, mainly through an invertebrate survey that Mike Edwards and I did at Butcherlands there in 2017. Rye Harbour has only jumped by 79 species to 4354. So watch out Rye Harbour, Ebernoe Common is gaining on you! There have been no changes in the rankings of the top ten. With help from Mark Colvin and Martin Allison, we added Arched Earthstar to the reserve network list at Ebernoe in 2018. I think this is now Near Threatened. I appreciate some of these are smaller, less-designated and under-recorded sites, so these huge percentage increases are less relevant but where they are extremely significant are where the sites already have fairly large lists. The increases at Graffham Common, Waltham Brooks, Ditchling Beacon and Seaford Head are particularly significant. I found immature Lichen Running-spiders Philodromus margaritatus (nationally rare, Near Threatened, BAP) at Graffham Common late in 2016 but didn't confirm by getting an adult until the following year. This was new to all SWT reserves. The mean year of the last record has risen to 2007. It may well be that this is always around 12 years earlier than the time of analysis. I will test that theory this time next year. Interestingly the mode still stands at 2017 for all records but more species were recorded on our reserves in 2018 than any other year (given that the spreadsheet only shows the last year, this isn't technically correct - it only applies to the last year it was recorded on a site). A total of 2200 species were recorded last year or 21.5% of all the species we have ever recorded. We have recorded 6513 species of invertebrate on our sites, an incredible 63.4% of all the species recorded. Of these, 1203 (18.5%) have some form of conservation status. This is a great metric to assess a site's quality for invertebrates. It's incredible to think that Rye Harbour has had 3225 species of invertebrate recorded on it. It would be our second most species-rich reserve even if it had nothing else there than invertebrates! It's the proportions of species with conservation status that are most interesting though. Rye Harbour has 15.1% but this isn't followed by Ebernoe, Ebernoe is actually 11th if you compare it this way. In fact it is Iping and Stedham Commons with 14.0% of its 2954 invertebrate species having status status. In fact, Woods Mill has had more invertebrates recorded on it that Iping, with 1646 species. Yet only 5.5% of these have status. Reflecting the very different nature of these sites. There is lots of woodland on Wealden clay but very little heathland in Sussex (reflecting the national picture) and early successional habitat, such as that at Rye Harbour and Iping Common, is at a premium. Therefore the species that occur there are often by their very nature, rare or scarce. Ebernoe has some spectacular old-growth woodland (late successional) which is also a rare habitat but the closing over the habitat here has diluted the species list with ever increasingly commoner woodland invertebrates. However by haloing some veteran trees and creating new species-rich grassland at Ebernoe (Butcherlands), we are addressing this imbalance. So here are the top ten reserves ranked by the number of invertebrates recorded there. And here is the top ten reserves ranked by the proportion of those species that have conservation status. This is a great way of removing as much recorder bias as possible and becomes more powerful the more species you record. Please note, only sites with more than 250 species have been included in both these analyses. This is ALL invertebrates. Old Lodge is ranked in 21st place with only 5.8% of the 1054 species having conservation status, much lower than the West Sussex heath sites. This is a direct reflection of the site being cooler and higher. 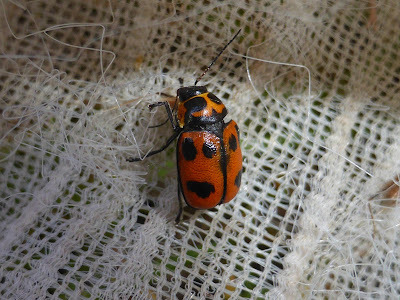 It has a lot of species that are scarce in Sussex, but widespread in the north west. These themselves not being afforded conservation status. It would undoubtedly score high on the proportion of species on the Sussex Rare Species Inventory but I am yet to look at this. Graffham Common sits on the Greensand Ridge in West Sussex and is ranked 5th! Not bad for an old conifer plantation that isn't even a SSSI! For a bit of fun I had a look at which county, East or West Sussex, had the most species overall. It was quite close. East Sussex wins with 7716 and West with 7406. What next? I have been talking to some wildlife trusts about helping them put their lists together and next week I will be talking to a national wildlife trust event about monitoring at the landscape scale level and I will be presenting this spreadsheet, analyses and the benefits. Make no mistake, this IS landscape conservation. Here, the landscape is defined as the Sussex Wildlife Trust reserve network. Landscape scale conservation can be about detailed species recording AND large scale trends and patterns, the two are not mutually exclusive. By comparing between sites, you can look at the 'unique' species, proportion of species with conservation status, proportion of regionally scarce species, how sites compliment each other, spacial analyses, introduced species, ubiquitous species and much more. It's a great way to be informed about your sites. The introduced Asparagus Beetle was added to the reserve network in 2018 by sweeping heather at Iping Common. As you do. You could do this with any network of sites at any scale, the modular nature affording both internal and external comparisons. As long as you have some assessment of quality (here I am using conservation status of invertebrates) you can start to make some valid comparisons. It just takes a bit of grunt work to build and maintain the species lists and a constant effort of recording across all taxonomic groups. I have been blown away by how many people have contributed to this since the first draft was produced two years ago, it really is a lot more than just my efforts. Obviously the role of the Sussex Biodiversity Record Centre is vital in this for storing and managing the data and Bob Foreman's input has been particularly appreciated. Without your local records centre, this kind of derivation of the data would be impossible. Whilst moth-trapping at Ebernoe Common, Tony Davis recorded the Pondweed Leafhopper (DD, BAP) at light new to the network in 2017. And below the reserve volunteers at Selwyns Wood recorded Coral-root (nationally scarce) new to the network where it appeared after their ride management. A total of 146 species have been recorded, 17 of which have conservation status (11.6%). “Lowland heath is richest habitat for spider diversity in UK” Andy Phillips, county spider recorder, Adastra 2006. Despite this it has proved difficult to persuade arachnologists to visit Old Lodge. The Raft Spider Dolomedes fimbriatus is widespread in areas of wet tussocky grass as well as ponds and the stream. The bright green Micommatta virescens is frequently seen amongst tussocky grass. 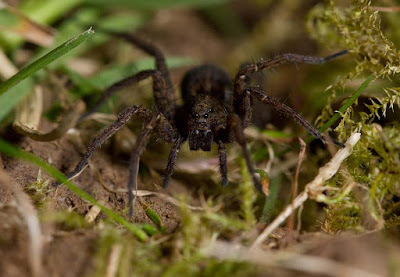 The invertebrate survey of 2013 recorded 112 species of spider including Araneus marmoreus, Walckenaeria acuminata, Micrommata virescens and Philodromus histrio. Visits to Old Lodge by Andy Philips, Graeme Lyons and Evan Jones were made in March 2017 and by Graeme Lyons in November 2018 to search for the rare spider Thanatus formicinus which was last seen in Sussex nearby in 1945. Although they were unsuccessful, a number of other rare species were found on these visits chiefly the money spiders Hypselistes jackosni and Notiscopus sarcinatus. A 5% increase in species on reserves in two years from 9790 to 10241. Nearly 5000 new site records in two years. At a glance analysis of conservation statuses across all invertebrate groups. Over 1200 species of invertebrate with conservation status now recorded. Easily editable data for producing biological sections for management plans. A new dimension to engage the already exceptionally engaged recording community on our reserves in Sussex. Endless interesting statistics, such as 3847 species have only been recorded at one site while only three have been recorded at all 32. So why not pan-species list your wildlife trust, conservation charity, region or site? The results speak for themselves. 2 Response to "What has pan-species listing Sussex Wildlife Trust's reserve network done for us?" A Hurculean effort Graeme. I completely agree on the value of non-structured survey for locating species that are otherwise missed. Structured survey, whilst very valuable, is also very expensive in terms of time and/or money. So we need to get all the mileage we can from unstructured survey to complement it. Absolutely! Casual records can also get lost so using the spreadsheet to catalogue all the species with status (up to date statuses mind) in the man plans is really key too. The accumulative list is so important.